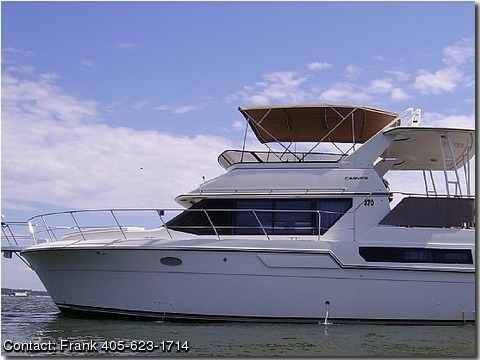 1991 CARVER BOATS 370 aft cabin, 37' Totally upgraded inside and out, this Carver 370 is in excellent condition! ACCOMMODATIONS: Two staterooms, Sleeper couch, Sleeper Dinette, matching chair, flat screen, Clarion stereo, Vacuflush heads. MECHANICAL EQUIPMENT Crusader 454's ,Westerbeke 7.0 KW, Halon system, Engine room heater, 3 stage battery charger, Trim tabs, Hydraulic steering, Vacu fush heads, 3 Zone Heat/Air. GALLEY EQUIPMENT: 3 burner stove, Oven, Stand up Frig/Freezer, Sink, hot/cold pressure water, Lots of storage. ELECTRONICS: NAV Garman GPS with Gchip of Texoma, depth sounder, compass, VHF, Clarion Stereo. DECK & HULL: Good automatic windlass, Full canvas with eisenglass enclosure, Spiral stairs to swim platform, Danford Anchor. ADDITIONAL EQUIPMENT: Flybride seat covers, front sun pads.